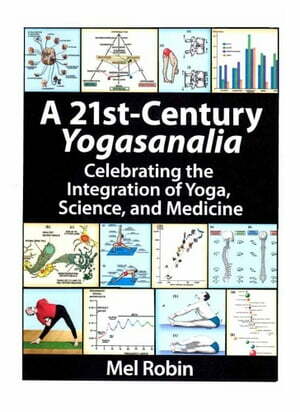 Collins Booksellers - A 21st-Century Yogasanalia by Mel Robin, 9781627870214. Buy this book online. A 21st-Century Yogasanalia: Celebrating the Integration of Yoga, Science, and Medicine is a modern-day Yogasanalia combining different aspects of yoga, medicine, and science in a timely and important effort to benefit both East and West, yogic and medical science. It is a culmination of twenty years of modern scientific research, often carried out in areas far removed from yoga as we otherwise know it. Working to expand beyond the physical principles of yogasana practice, author Mel Robin first researched both the yoga literature and the medical sciences as completely as possible, starting in 1998, then began juxtapositioning the two sciences in this ebook for the benefit of its readers. Because this handbook has more than two thousand pages of material integrating Iyengar yoga with the medical sciences, it is available only as an ebook. Beginning in elementary school, Mel Robin became enamored with gymnastics and went on to practice through his college years (1953–1956) at UCLA, earning All-America honors in his final two years. From there, he turned to his second favorite field of study, Chemical Physics, earning a PhD from the University of Washington (1957–1960); following this, he had a 28-year stint as a distinguished senior-scientist at Bell Telephone Laboratories (Murray Hill, New Jersey), where he focused on molecular-electronic structure, eventually publishing 104 refereed papers and three books.